They've adopted Uber's contract worker model -- and now, they're fighting the same legal battles. 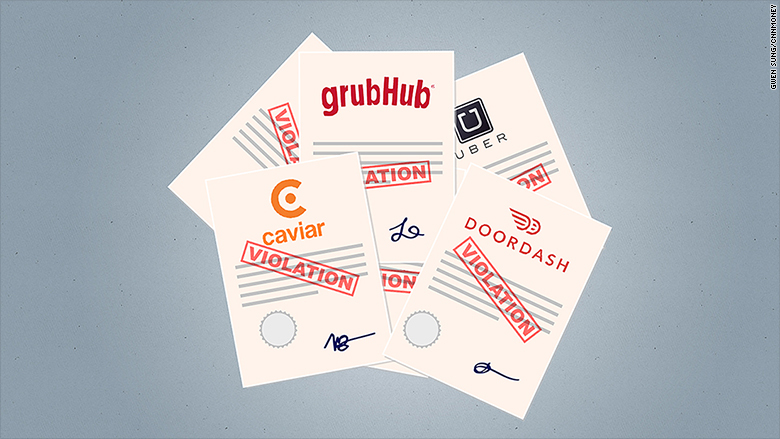 Three on-demand food delivery companies -- GrubHub (GRUB), DoorDash and Caviar -- were hit with lawsuits Wednesday in a San Francisco Superior Court. The suits allege that the firms are improperly classifying workers as independent contractors while treating them as employees. Workers must pay for expenses like gas, parking fees and phone data, which would be illegal under California law if they were classified as employees. Attorney Shannon Liss-Riordan says these companies are skirting the rules by using improper worker classifications. Liss-Riordan is the attorney for all three new cases and is also representing similar cases against Uber and at least seven other on-demand companies. "They've all seen Uber do it and become so wildly successful that they think it's OK," said Liss-Riordan, who is based in Boston. "[They're] trying to use the excuse that there's something new and different -- the so-called 'on demand economy' -- and that they're somehow licensed to ignore the wage laws." GrubHub -- which went public in April 2014 -- hires contract workers to deliver food ordered from restaurants that may not have their own delivery services. One driver, Andrew Tan, alleges that his pay as a GrubHub worker fell below California's minimum wage during many weeks because of the costs of fuel and vehicle maintenance. When Tan worked overtime, he wasn't compensated with overtime pay. GrubHub said it would not discuss pending litigation; DoorDash and Caviar did not immediately respond to requests for comment. While the GrubHub and DoorDash lawsuits are class actions, the Caviar complaint is on behalf of an individual driver in San Francisco. That's because Caviar requires workers to sign an arbitration agreement that says any suits must be filed as individuals -- not as part of a group. Liss-Riordan said this practice isn't uncommon. On Thursday, her law firm filed a separate complaint with the National Labor Relations Board against Uber for using fine print in arbitration agreements to defeat class actions. She said they could potentially file similar suits against firms like Caviar. In the Uber suit, drivers who have joined Uber since June 2014 are excluded from the class because of the arbitration agreement they signed. Liss-Riordan plans to challenge the ruling, but in the meantime, drivers can join the suit individually. "We're getting calls all the time, we're sorting through complaints," said Liss-Riordan. She added she's been "heartened" to see some companies reclassify its workers as employees. "[Some] have denied it has anything to do with lawsuits, but you know the legal consideration must have been affecting them."